YourRate offers state of the art digital solutions for authentic Client-Feedback. You can choose from a variety of Review Channels to reach customers and receive Client-Feedback. You decide which reviews you want to publish on your Website-Widget and your business Profile Page. Your receive an immediate notification, when a negative review has been left, so you can react in time. Our digital questionnaires allow you to survey your clients indvidually by asking key questions referring to your business. Your Reviews on your Website published in real time Choose the Widget that fits your Website best from a variety of different designs. Indicate transparency and Trust by using the YourRate-Seal. Place the Sticker at your Location or as a digital feature on your Website. Google listings will display your reviews. By continously publishing reviews, you will leave your competitors behind. 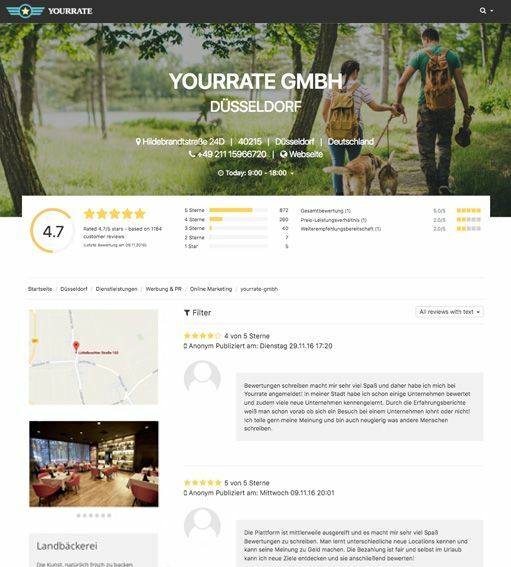 Based on the published reviews and your overall rating, the visitor of the Website gets an idea about your business and the quality of the services you provide. Feed Google and other search engines with your most recent reviews. This how you reach new clients, which leads to more sales for your business. Find out what your clients like and appreciate, or critisize about your business. Recognize trends at an early stage as well as possible improvements. Increase customer satisfaction and thereby long term customer loyalty.